Need a healthy snack for your fussy toddler? 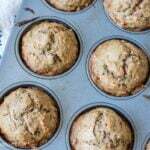 These healthy muffins are filled with carrot and zucchini and naturally sweetened with raisins and applesauce. Kids will love them and you’ll feel better knowing they are eating at least a little bit of vegetables! While my 1 year old is still young enough to try most foods, my 3 year old is going through the stage of refusing any and all vegetables. So for the past few months, I’ve been trying to figure out ways to at least sneak some little bits of vegetables into his diet. For dinner, roasted sweet potato always works. He also likes raw carrots dipped in hummus and I’ve been working some cauliflower rice and kale pasta successfully in over the past few weeks too. When I came across a few recipes on Pinterest for “veggie-filled muffins” I knew I had stumbled across a good idea. And when I shared my attempts on Instagram last week, you all begged for the recipe. So here it is! These toddler approve muffins are quick to make and are really quite delicious. Our batch of 12 only lasted a few days since my toddler and 1 year old wanted them for snack every day…plus mama & daddy enjoyed our fair share too. We love to eat them warmed up with some butter spread on top but they are delicious by themselves, too! I’ve tinkered with a few different recipes before settling on my own version that is refined-sugar free (it only has some maple syrup and golden raisins for sweetness). Many of the recipes called for vegetable oil (yuck!) which I replace with either olive oil or apple sauce depending on what’s in the pantry. I’ve also added in some wholewheat flour and flax for an extra fiber kick! I don’t recommend giving these to your kid as a solo breakfast because they are not substantial enough, but alongside a side of fruit or yogurt would be good. Personally, I keep them as a mid-morning or afternoon snack so that I can avoid things like crackers or goldfish. Need a healthy snack for your fussy toddler? These healthy muffins are filled with carrot and zucchini and naturally sweetened with raisins and applesauce. Preheat oven to 350 degrees. Grease a 12-count cupcake tray. Squeeze the excess liquid out of carrots and zucchini. You want them to keep the cupcakes moist but not make them soggy. In another bowl, whisk eggs and apple sauce. Stir in grated zucchini , carrots and raisins (and optional flaxseed). Fill cupcake trays until 3/4 full. Bake for approximately 20 minutes. They are done when a toothpick inserted comes out clean, and tops spring back when lightly touched. Allow to cool in cupcake pan for 10 minutes before removing.